When’s the big day – Their big day is set for Saturday, May 19th and will take place at St George’s Chapel in Windsor Castle where the young prince himself was christened, with the ceremony starting at 12pm precisely. Despite the Lord Chamberlain’s Office at Buckingham Palace being responsible for organising royal weddings, Harry and Megan are taking the lead on core aspects such as the music, flowers, decorations and of course the reception. Invitations – As with any royal wedding, it’s not a small affair. Invitations have been sent to a whopping 600 guests with a very select 200 (that’s still HUGE!!!) being invited to an after party at Frogmore House. The invitation itself will be die stamped in gold, featuring the Three Feather Badge of The Prince and will also reveal the dress code which is uniform, morning coat or lounge suit and day dress with hat. Those who’ve been lucky enough to receive an invitation aren’t yet known but they should be revealed in the forthcoming weeks, however we do know that we haven’t received one…yet. Best Man And Bridesmaids – The Duke Of Cambridge, Prince William is expected to be Best Man, quite possibly along with one of Harry’s childhood friends as the trend for more than one Best Man becomes more popular of late. It’s also highly likely that Prince George and Princess Charlotte will be pageboy and flower girl while Megan has apparently chosen her own bridesmaids, most likely to be Indian actress Priyanka Chopra and possibly stylist Jessica Mulroney. The Dress – When it comes to the dress, all bets are off as the designer of the dress itself is still unknown. From Australian brand Ralph and Russo to London based designer, Erdem; all will be revealed however, on the big day itself and we literally cannot wait to see the bride in all her glory. Traditional Ceremony – As expected, this royal wedding will take a similar stance as previous weddings keeping things super traditional with the couple making their vows at Windsor Castle’s St George’s Chapel. 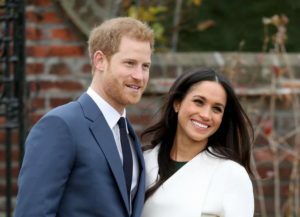 The Dean of Windsor will be conducting the ceremony while the Archbishop of Canterbury will be officiating the couple as they make their marriage vows. As a UN women’s advocate however, it’s believed that Megan is unlikely to opt to “obey the prince” unlike previous women have done in the past. Flowers – Just like any bride and groom, flowers will of course play a huge part in the couple’s big day and it’s all thanks to the high society florist Philippa Craddock who’ll be using seasonal plants and flowers from the Crown Estates and of course the Royal Parks. Did you know the flowers will be chosen for their pollinator-friendly attributes so as not to disturb anyone during the ceremony? As with most things to do with the royal wedding, we can never be too sure just what’s going to happen but we cannot wait to see just what happens on the big day itself and we certainly can’t wait to hear the couple themselves say “I do”. Here’s to Prince Harry and Megan Markle and their fabulous forthcoming nuptials, or what’s otherwise known as, the wedding of the year.